The 12 Questions series of interviews continues this week with sprint car driver Rico Abreu, who won the Gold Cup earlier this month in Chico, Calif. These interviews are recorded as a podcast but also transcribed for those who prefer to read. Usually if I’m thinking about a race or if I’m leading up to a big race, obviously I’ll be thinking about it all the time and I’ll have some dreams about it. But I think the biggest thing is I’m around race cars all the time and here working on the sprint cars. So it’s basically my life and it’s all I think about. The biggest thing is just the work ethic that we all put into this team. I have had some dreams where things go wrong and then some dreams where things go good. Sometimes when I have good dreams, big dreams, I’ll jot them down or I’ll remember them three or four days later. But I haven’t had any serious dreams about racing, just a few here and there of my car. Maybe just sometimes I’ll think about the attitude of my car and how it feels when I’m on track and that’ll come into a dream one time. But I’ve never really thought about that. 2. If you get into someone during a race — intentional or not — does it matter if you apologize? I assume no one would really get into another person intentionally in sprint cars because that would pretty dangerous. But if you do have an incident with somebody, does it matter if you apologize to them later? I think it does later on. If you run into somebody or crash with somebody and they’re upset with you — or if they’re not — I think it just shows the level of respect if you go down there and apologize even if it wasn’t your fault. Sometimes people think things are different than you think. I think it goes a long ways when people that you don’t think pay attention to your racing or what you’ve got going on in your career — when things start to change and your career can kind of go in a different direction and like it looks like it’s going downhill based off results — when people reach out to you and just show they see what’s going on and understand how difficult things can get. People who’ve reached out who you don’t realize that are paying attention to your career or racing and say, “Hey, keep working hard,” or, “Good job,” or anything on that level. Or winning a race, I feel like your true friends or your true fans who are close to me reach out and said, “Good job,” just because of the people, they know the work that gets put into this and how difficult it is. Even in any level of racing, when you run a race team at a high level and you win or you run good or you’re competitive every night, people pay attention to that, and I like reaching out to people that I see that put a lot of work in or have a lot of drive and passion for the sport and have success. I like to reach out to them and say, “Hey, that’s really cool that you won,” or “You had a great run.” I just think it means a lot to those people, it means a lot when I get a message like that. I won earlier in the year, and a guy like Chip Ganassi, he reached out. I don’t know if he follows my path lately just because of the direction it’s been going which is not NASCAR-related, but he’s seen I won and he reached out and said, “Good job” and that he likes winners. So I just have something like that with Chip, or Tony (Stewart) reaches out all the time even though my relationship with him is where I see him so often, but he still takes the time to reach out. So when Chip reached out to you, he reminded you, “I like winners” just like he says on Twitter? Yeah, he just said, “Good job” and “I like winners,” which is really cool. 4. The World of Outlaws comes to you and says they’re bringing a celebrity to the track and they want you to host them. Who is a celebrity you’d be excited to host? I think it’ll be really cool to bring LeBron or Steph Curry or someone who’s a real spotlight in the world right now just to kind of show them what our sport is. I think some of them have been kind of NASCAR racing and seen that side of it, but more of the grassroots stuff (is) no different from them going back and playing high school basketball or playing with the high school they went to or just shooting some hoops. It would be cool for a guy like that to come in and just kind of see how it all goes. 5. In an effort to show this is a health-conscious sport, the World of Outlaws decides to offer the pole for an A-main for an upcoming race to the first driver willing to go vegan for one month. Would you do it? I don’t know. I don’t think so. No? You like your meat? 6. It’s time for the Random Race Challenge. I’ve picked a random race from your career and you have to tell me where you finished. This is the 2015 Dover K&N East race. Yes. And one of the Rev Racing cars won. I don’t remember. I think he was in a Rev Racing car. He was. See, you remembered this right away. Yeah, so the first half of the race, the Butler Built seats have the head inserts inside of the head restraint, and it actually fell off. In the East race, there is split, so I think you do, I don’t know if you do 100 laps, if you do 50-50, or if it’s 50 laps. So I ran the first half and then you get a five-minute break. Well one of HScott/Justin Marks team (crewmen), they jumped in the car and like tied or taped my headrest on my seat. And then I ended up running second in the race. I was actually really good. Mardy Lindley was my crew chief. That was a fun year in stock car racing for me. I was looking at some of the people who you beat in that race who are current NASCAR drivers. Yeah, Byron, Landon Cassill, Corey LaJoie, Justin Haley, Kaz Grala. You were on it. Yeah, I feel like that’s one of the tracks that really suited my driving style while I was in stock cars. Just the high banking, the fast rolling corners, it kind of raced more like a dirt track where you, a lot of on throttle time. I really enjoyed that race. 7. Who is the best rapper alive? Are you into rap at all? I don’t really listen to much. I know Snoop Dogg, 50 Cent, those are all old music I used to listen to. I listen to a lot of country and a lot of rock and roll. 8. Who has the most punchable face in the World of Outlaws? I don’t know…Donny Schatz? He just wins everything. 9. The World of Outlaws enlists three famous Americans to be involved with your team for one race as part of a publicity push: Taylor Swift, LeBron James and Tom Hanks. Choose one to be your crew chief, one to be your team owner and one to be your motorhome driver. Definitely LeBron the team owner, I feel like just because of his positioning and how he’s built his team and how he won all those championships in Cleveland, or went to the Finals so many times in Cleveland. I’ll put Tom Hanks as the crew chief and Taylor Swift as the bus driver because she’s probably a good cook. I honestly go down to all the haulers, look at the nicest hauler, and ask the guys if they have a bathroom and ask them if I can use it. I go to Donny Schatz’s trailer a lot and I go to Jason Sides’ trailer. Yeah, I just ask and make sure. It’s a big topic around here because sometimes the bathrooms at the racetracks aren’t too nice and no one likes going into a hot port-a-potty at 3 o’clock in the afternoon. But I go to Donny Schatz’s trailer, I’ll ask Scuba, the car chief, if the bathroom’s OK to use and Scuba will say yes or no; and if he says no then I’ll go down to Jason Sides’ trailer, who usually tells me yes. 11. The World of Outlaws decides they would like the highlight reel value brought by the former Carl Edwards backflips and want their own version. How much money would they have to offer for you to backflip off your car following your next win? I don’t know. I don’t know if it’s more about the money than getting hurt. I’ve seen videos of Tyler Walker doing backflips after he won and then Carl Edwards. There’s a video of Tyler Walker tearing his ACL or something on YouTube when he does a backflip at Grandview Speedway. I just don’t know if I could really get the flip, all the motion all the way over, or you see those videos on Barstool where the guys do the flips and land halfway on their neck. So it doesn’t look too comfortable. 12. Each week, I ask a driver to give me a question for the next interview. Last week was Will Power. His question for you was: Would you ever like to try an IndyCar, and if so, would you like to try it on an oval or a road course? I definitely would love to run an IndyCar someday. My goals going into my whole racing (career) — if I had to put goals at the top that people dream of doing — it was always to run the Daytona 500 and the Indianapolis 500. So I definitely would like to run in an IndyCar on an oval. I think they put on some great racing. I would like to run the Daytona 500 as well, which I thought was going in that direction, but things shifted and things change through people’s career paths. I still haven’t given up on all that (with NASCAR), I just feel like there’s a better time later on down the road. I don’t know. I think, I definitely, if I’m going to do an IndyCar race, it’ll be on an oval. I don’t know who the next interview is going to be with, but it’s going to be with a NASCAR driver. Do you have a question I might be able to ask somebody in NASCAR? Ask them what they see most about drivers giving back to grassroots racing, as in Kyle Larson coming sprint car racing. Yes he loves it, but how he handles justifying coming to sprint car racing, going through that transition, and it makes it all work of going back and forth back and forth, and why some guys don’t do it more. Why Kyle Busch doesn’t go run more Late Model races or why does Christopher Bell not come and run more sprint car races? I know that some of them are limited, but why are they so limited to it? Why doesn’t Chip Ganassi let Kyle Larson race on Thursdays before a Cup weekend? Yes, I see the money they have invested in him, but I just feel like the more of those guys that race, the better they are on track. I feel like we’re dirt racers, we’re all used to being up until 2 a.m. and the next day, getting up at 11 o’clock and going to your next race. That’s the biggest talk right now, is these drivers coming back to the grassroots. I feel like there wasn’t as much as it until you had Kyle and Christopher and Tony doing all of these races. And you know, I feel like they have such big fan bases in this market or this sanctioning body, the World of Outlaws or any just local races, they could draw so much out of this. And why wouldn’t their sponsors want to be a part of this sport as well? They get so much more, coming here and being attached to them. I don’t know. It’s all cool to see it all going on. 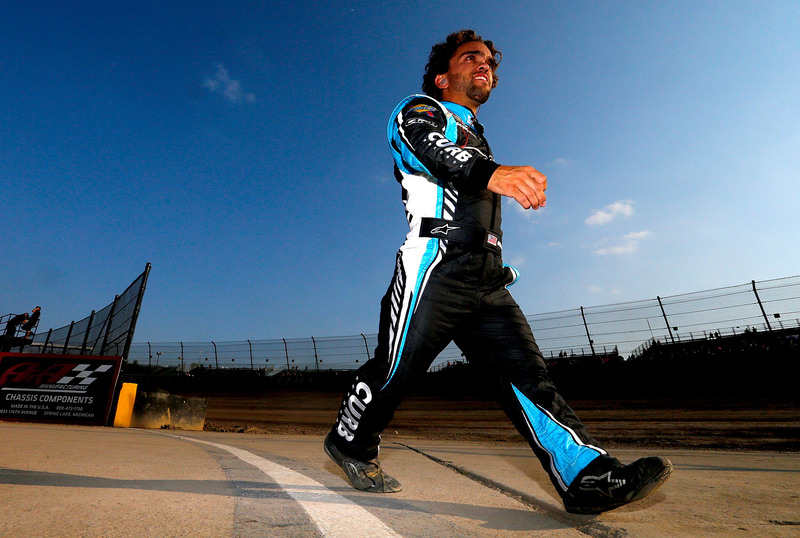 This is the first 12 Questions interview with Rico Abreu. Great interview Jeff. Rico caught my attention with a cool name and cool friends (Tony). Now I hear him speaking with such grace and confidence. I feel the world is at his feet. Now if only Smoke could slide him into a SHR Xfinity ride.